New York’s iconic Statue of Liberty and Liberty Island will reopen to the public Saturday one day after a bomb threat that led to its evacuation was declared unfounded, officials said. The NYPD bomb squad on Friday examined a locker thought to contain a suspicious package and found it was empty, a law enforcement official said. Police declared the scene clear at 3:15 p.m.
Other lockers checked as a precautionary measure, the law enforcement source said. All civilians were evacuated and only emergency personnel remained on Liberty Island, according to police. The fire department had EMS units there as a precaution. Burke said about 2,700 people were safely transported from the island and offered full refunds. Service to Liberty Island is to resume at 8:30 a.m. Saturday. Shortly after 11 a.m., the National Park Service was informed that a 911 caller made a threat to blow up the Statue of Liberty which led to the evacuation, according to park service spokeswoman. A sweep by U.S. Park Police canine units “alerted on an area of interest near the lockers at the base” of the Statue of Liberty. Park police had notified the NYPD, which dispatched its bomb squad, officials said. It is not uncommon to get false positives from the bomb-sniffing dogs. “Following their investigation, it was determined that there was not an explosive device,”. 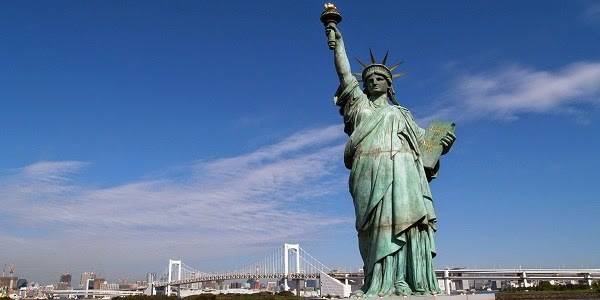 Approximately 3.5 million people visit the Statue of Liberty every year. Visitors must pass through security screening similar to airport security procedures, according to the National Park Service. Previously, the statue closed in November 2012 because of significant damage sustained from Superstorm Sandy. It reopened on July 4, 2013, with a ribbon cutting ceremony and long lines of tourists. The last time the island shut down to the public was in October 2013, when it closed for 12 days because of the a government shutdown. The statue was dedicated by President Grover Cleveland on October 28, 1886. It was a gift to the United States from the people of France to commemorate 100 years of Franco-American friendship as well as the centennial of America’s independence.